1. How do we know you? As a nightlife bon vivant who parlayed his penchant for dressing up into a career in design. I am currently designing Social Primer for Brooks Brothers, and I just launched my own collection: Social Primer by K. Cooper Ray. 2. What is your latest project? Launching the collection Social Primer by K. Cooper Ray during New York Fashion Week. I am also a featured designer for Charleston Fashion Week. 3. Where are you living? In the historic and beautiful city of Charleston, South Carolina, which was recently voted by Travel + Leisure as the Best City in the World. 4. What don’t we know about you? I am a rabid college football fan and I have a novel about high society written but not yet published. 5. What is your favorite travel destination? It is a toss up between Rome, and Lyford Cay, Bahamas. Everything. I take probably fifty pictures a day. From a bug on a leaf, to the color of a street sign, or of anything odd with an unexpected color combination. The men of Charleston are also a great source of inspiration. 8. What book is your bible? It’s a toss up between awesome and brilliant. 10. Who is your biggest hero? My mother and increasingly my brother. 11. How would you define your success? What is your current state of mind? Cautiously optimistic but content. 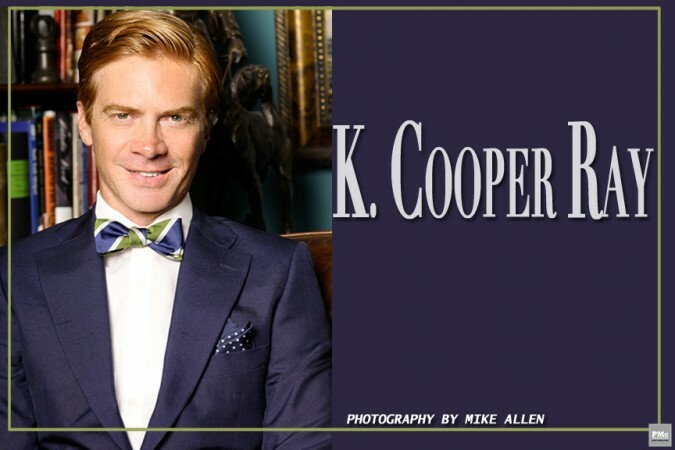 K. Cooper Ray was born in Montgomery and is a thirteenth generation Southerner and a seventh generation Alabaman. He served as Vice President of Bottega Veneta and Ambassador of Dom Perignon before launching SocialPrimer.com in 2008 and has been featured in Vanity Fair, GQ, Town & Country, Elle, Marie Claire, The New York Times, The Wall Street Journal and Los Angeles Times as well as a recurring etiquette segment on The KTLA Morning Show. Cooper has lived in New York City, Milan, Italy, Cape Cod, Los Angeles and now Charleston, South Carolina. He is a bow tie designer (Social Primer for Brooks Brothers), sailor (2006 regatta crew winner), Tavern & Music Hall proprietor (Eighth & Rail), and was recently chosen one of Angeleno Magazines’ Top Ten Men of Style. He is the author of the Manhattan society satire Last Night at Moomba and is an established fixture on the social scenes in Los Angeles and New York.